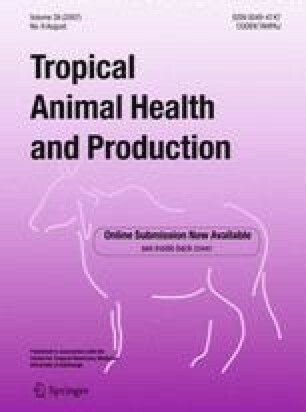 300 goat serum samples from an export-oriented abattoir were tested for contagious caprine pleuropneumonia antibodies by the complement fixation test. The disease prevalence was 31% with no significant differences (P > 0.05) between the regions “Borena”, “Bale”, “Afar” and “Jinka” or the age of the goats (P > 0.05). Gross pathology and histopathology of the lung primary lesions were indicative of pleuropneumonia caused by Mycoplasma capricolum subsp. capripneumoniae.